Are you tired of pruney fingertips and stinky germ-collecting sponges? If so, you may want to consider investing in a new portable dishwasher. What Exactly is a Portable Dishwasher? Let’s face it, no one really enjoys washing dishes by hand. So, if you’re home is missing a dishwasher, or you regularly travel in an RV, a portable dishwasher is an answer to your dilemma. A portable dishwasher will fit just about anywhere -- on top of the counter, underneath the counter, some will even fit inside of a cabinet. Get your hands on a portable dishwasher and stop washing dishes the old-fashioned way. Believe it or not, dishwashers have been around since the middle of the 19th century. Back in 1850, Joel Houghton built a wooden machine that splashed water on dishes. In 1886 Josephine Garis Cochran patented a more modern machine for washing dishes. A couple of decades later, in the early 1900’s, portable dishwashers started to hit the market and find their way into people’s homes. Over the years, dishwashers have obviously advanced quite a bit. At first, technically all dishwashers were sold as portable machines. During the 1960s the portable dishwasher became automated and stationary as well. Within another decade the dishwasher had become one of the most common households appliances in the United States. After a few more decades, the portable dishwasher has regained its popularity. Now, instead of having to take up permanent space in the kitchen of your home, RV, cabin, or boat, you can stow it away when you’re finished washing the dishes. Making any major purchase requires a well-informed decision. So, with that in mind, here are a few frequently asked questions about portable dishwashers. How does a portable dishwasher drain? One hose transfers fresh water from the faucet straight to the portable dishwasher, while another hose transfers the dirty water to the sink’s drain. You should always make sure each of the hoses' couplings is tightly fastened, as a loose connection can come apart and cause serious water damage. Can you hook up a portable dishwasher permanently? Yes. Technically, you can convert a portable dishwasher to a stationary dishwasher simply by replacing the hoses with permanent plumbing. You will also need to install a dishwasher drain adapter under the sink where you'll be permanently connecting the portable dishwasher. How big is a portable dishwasher? Portable dishwashers come in various sizes. Typically a portable dishwasher is around 20-inches wide, 18-inches deep, and somewhere around 36-inches high. However, you will find that they come in a variety of unique shapes and sizes as well. 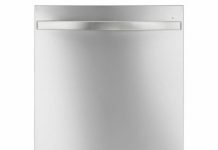 What is a freestanding dishwasher? A freestanding dishwasher is a portable dishwasher which is meant to be installed and stored underneath a countertop. Some will even fit inside of a cabinet if you’re willing to do a bit of customization such as drilling holes for the hoses to fit through. What is a countertop dishwasher? A countertop dishwasher is a smaller portable dishwasher which is designed to fit on countertops and flat surfaces. They function the same as larger dishwashers, but are more compact and use less energy. There are several factors you’ll need to consider before coming to any purchasing decision including size, design, power usage, and features and functions. Here are a few of the most critical things to take into consideration when shopping for a portable dishwasher. 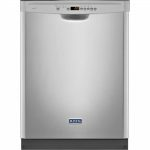 The most crucial consideration to make when purchasing a portable dishwasher is the size and space. You'll need to figure out where you’re going to be using it, and how much space is available. Will it be on a countertop or under one? If it’s going under a counter, you will need to measure the space and make sure there is enough room for the dishwasher and all of its connections. You’ll also need to consider how heavy it is if you plan on moving it around. The water source you plan to use with your portable dishwasher is another vital aspect to think about. A portable dishwasher works with connections that temporarily attach to the faucet of your choice. However, these connections only work with threaded spouts. So, if your sink has a built-in sprayer, you’ll need to use a different faucet, install a threaded one, or use an adapter. The noise level of a portable dishwasher is also important to consider before purchasing. If you currently own a standard dishwasher or have in the past, you’re probably fully aware of how noisy they can be. Today, there are super quiet models available, so when shopping, look for the unit’s noise level. A decibel rating of under 60 dBA will make the least amount of noise. Lastly, consider the amount of power used by the portable dishwasher you’re looking at. Most portable dishwashers either run on 120 volts or 240 volts. Depending on size, design, features, functions, brand name and more, the price of a portable dishwasher ranges from as little as $200 to as much as $650. You can find a portable dishwasher online through mega-retailers such as Amazon and eBay, as well as at local favorite home improvement department stores such as Lowes and Home Depot. To bring you a list of nothing but the best portable dishwashers to buy in 2018, we turned the internet upside down. We searched home appliances forums, buyer’s guides, customer reviews, as well as manufacturer product descriptions. What we came up with was a list of the very best products including our pick for the number one portable dishwasher to invest in. The first item on our list is one of the most currently popular portable dishwashers. The compact portable dishwasher from hOmeLabs has six place settings, a dish basket, cutlery basket, cup rack and spray arms. It has 6-145 PSI water pressure, 120-degree hot water connection, and is Energy Star certified. The product dimensions are 17.2-inches wide, 19.6-inches deep, and 21.6-inches high. It also has a filter, rinse aid, drain pipe connector, dispenser connector and runs on 120 volts. You can find this product on Amazon. It has a 4.4 out of 5 stars rating based on customer reviews. This product has an approximate cost of $200 to $250. The SD-9241SS by SPT has eight place settings, error alarms, and an adjustable upper basket for plates and pots. It comes with six wash programs including all-in-one, light, normal, heavy, and rinse and speed. The product uses 120 volts and is Energy Star certified as well as having a quiet 55 dBA noise rating. Unit dimensions are 17.7 inches wide, 25.9 inches deep, and 36 inches high. It has a stainless steel interior and comes with 3 feet long connection hoses. This product is available on Amazon. It has a rating of 3.8 out of 5 stars due to customer reviews. The product has a price tag of between $450 and $500. 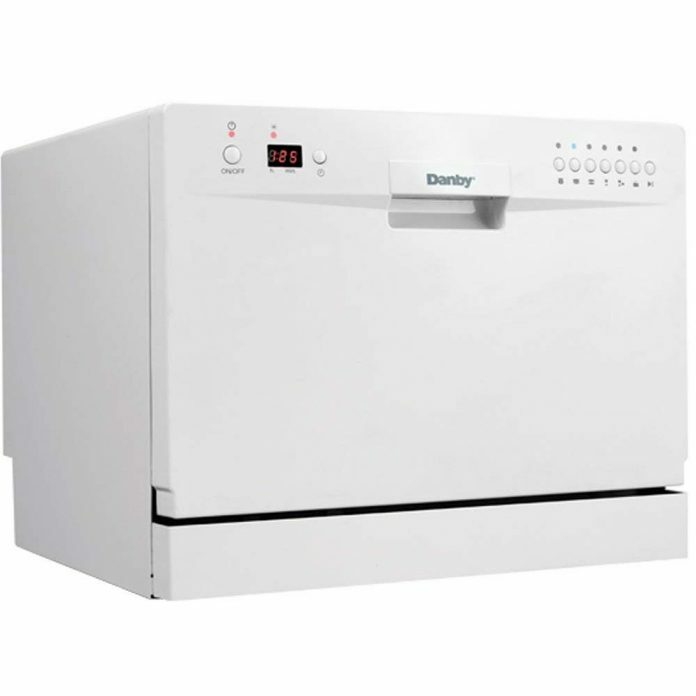 The first of two Danby’s to make our list is the DDW621WDB portable dishwasher. This one comes with electronic controls and an LED display. It has a stainless steel interior, six place setting capacity, a silverware basket and a space-saving design with a quick connection feature. There are six was cycles including economy, normal, extensive, rapid, glass and soak. It works on 120 volts. The unit’s dimensions are 19.7-inches wide, 21.6-inches deep, and 17.2-inches high. This product can be purchased on Amazon. It has a 4.1 out of 5 stars rating by customer reviews and a price range of $200 to $250. 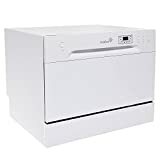 The second Danby on our list is the DDW1801MWP portable dishwasher, an 18-inch wide space saver on easy roll casters. 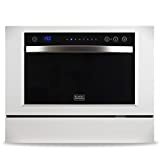 It has eight place settings, a silverware basket, a quick connect function and is Energy Star certified. There are six wash cycles including normal, economy, intensive, rapid, glass and soak. It runs on 120 volts and its dimensions are 26-inches high, 17.7-inches wide, and 36-inches high. This product is sold on Amazon. It has a rating of 3.9 out of 5 stars based on customer reviews and costs between $400 and $450. The BCD6W is the only portable dishwasher from BLACK+DECKER featured on our list. It's a bit more advanced than a standard portable dishwasher, with an LED display and touch controls. There are seven wash programs including normal, economy, intensive, glass, 90 minutes, rapid and soak. It also comes with a child lock feature, a 24 hour delayed start option, six place setting capacity and is Energy Star certified. This product runs on 220 volts and its dimensions are 21.7-inches wide, 21.5-inches high, and 17.2-inches deep. This product is available for purchase on Amazon. It has a 3.7 out of 5 stars rating by customer reviews and an approximate price of $225 to $275. 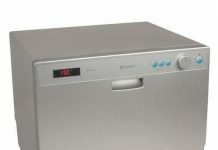 The second product from SPT to make our list is the SD-2201S portable dishwasher. It comes with easy to use controls, automatic detergent and rinse dispensers, a dish rack and silverware basket. The interior is made from stainless steel and has a plastic tub and spray arm. There are six standard place settings and a quick connect faucet adapter. It has six wash cycles including light, normal, heavy, glass, speed, and soak. The product is Energy Star certified and it runs on 120 volts of electricity. Unit dimensions are 21.6-inches wide, 19.6-inches deep, and 17.25-inches high. You can find this product on Amazon. It has a rating of 3.9 out of 5 stars and a price tag of between $210 and $290. 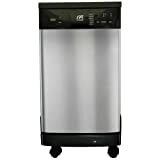 The final SPT portable dishwasher featured on our list is the SD-9241W. It comes with six wash programs including all-in-one, light, normal, heavy, rinse and speed as well as time delay features. There is an adjustable upper rack for pots and plates, a quick connect adapter and stainless steel interior. It runs on 120 volts and its physical dimensions are 26-inches wide, 17.7-inches deep, and 36-inches high. This product is on Amazon. It has a 4.1 out of 5 stars rating due to customer reviews and an approximate cost of $450 to $500. 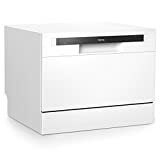 The Ivation portable dishwasher has a heavy duty stainless steel interior, easy to use controls and touch buttons. There are six wash cycles, automatic detergent and rinse dispensers, spray arm, and six place settings. It also comes with a sliding dish rack, cup shelf and silverware basket. The product's dimensions are 17-inches deep, 21.5-inches wide, and 20-inches tall. It’s great for countertops will little space to spare, comes in white or black, and runs on 120 volts. This product is available on Amazon. It has a 4.4 out of 5 stars rating based on customer reviews and a price range of $250 to $350. EdgeStar’s DWP62SV comes with six place settings, is Energy Star certified, and comes with a dish rack, cutlery basket, and cup shelf. 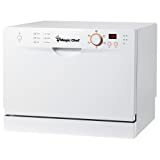 There are seven wash cycles, a sleek digital display, and a quick connecting standard size adapter. It has a stainless steel interior, a noise level of 52.3 dBA and runs on 120 volts. This product is also Energy Star certified. The unit’s dimensions are 17.25-inches high, 21.9-inches wide, and 19.9-inches deep. You can purchase this product through Amazon. It has a rating of 4.1 out of 5 stars by customer reviews and costs between $250 and $350. Last but surely not least, the Magic Chef MCSCD6W3. This portable dishwasher comes with six places settings and six wash programs including a quick wash. It has a stainless steel interior, a floating anti-flood switch, a residual drying system, and detergent and rinse dispensers. The product uses 120 volts and its dimensions are 20.4-inches wide, 21.7-inches deep, and 17.2-inches high. This product is sold on Amazon. It has a 4.2 out of 5 stars rating based on customer reviews and a price of approximately $200 to $250. 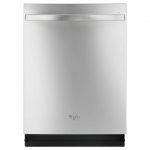 The DWP62SV from EdgeStar is our pick for the best portable dishwasher to own in 2018. Not only does it have more washing programs than most portable dishwashers, it also has one of the quietest noise levels in the entire industry. Not to mention that it will hold plates and pots up to 10.5-inches large and comes with a silverware basket, cup shelf, and dish rack. It’s also Energy Star certified. A combination of features and benefits you’ll be hard pressed to find in other products of the same class. Have you recently purchased a portable dishwasher from our list? Or possibly one you feel should have made our list? We’d love to hear from you, let us know all about it in the comments section below! Are you sick and tired of washing dishes by hand? 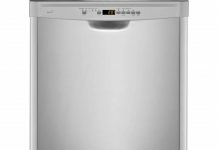 Then you should read on and find out all the great features of the Whirlpool Wdt780Saem dishwasher.